A section of the outside walls of the modern Coventry Cathedral designed by Sir Basil Spence after the old cathedral was destroyed by bombs in the blitz during World War II. 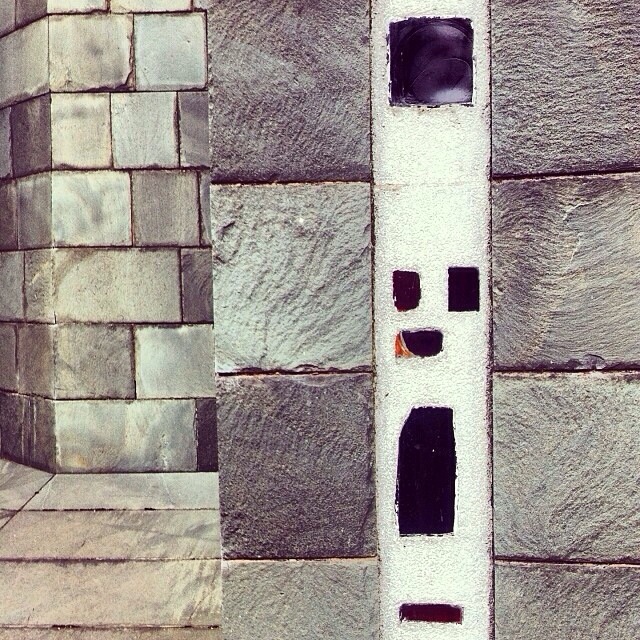 Some sections of the wall, as shown here, have coloured glass embedded in them. The building was started in 1955 and consecrated in 1961. Although controversial for its brutalist design it soon became an international destination for tourists and pilgrims. It is seen as powerful symbol of reconciliation and regeneration. A negative is the now compulsory entrance fee to the cathedral of £8 per person unless one can show that the primary reason you have visited is to pray. A compulsory charge, like this one, as opposed to a suggested charge or donation, restricts access to this major cultural site for many less well off people. This said entrance is free if one attends one of the daily services. The ruins of the old cathedral are free to enter and I recommend a visit followed by a visit to the excellent Coventry Transport Museum, just down the road, which is free to enter and has a good café.